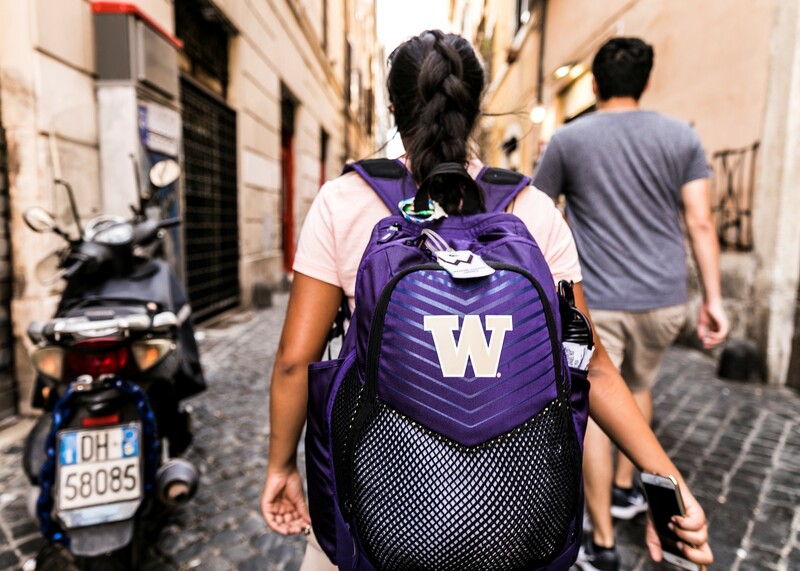 Thousands of UW students have had life-changing experiences all around the world with study abroad — but many students are deterred by the time or cost of traditional programs. Recently, innovative faculty have been exploring new models so that even more students can study abroad. At the UW Bothell School of Nursing, Associate Professor Mabel Ezeonwu has partnered with a local nonprofit to bring student health care providers to rural Guatemala. In the College of the Environment, Lecturer Kristi Straus has piloted a “global flip” program with Tsinghua University in China. 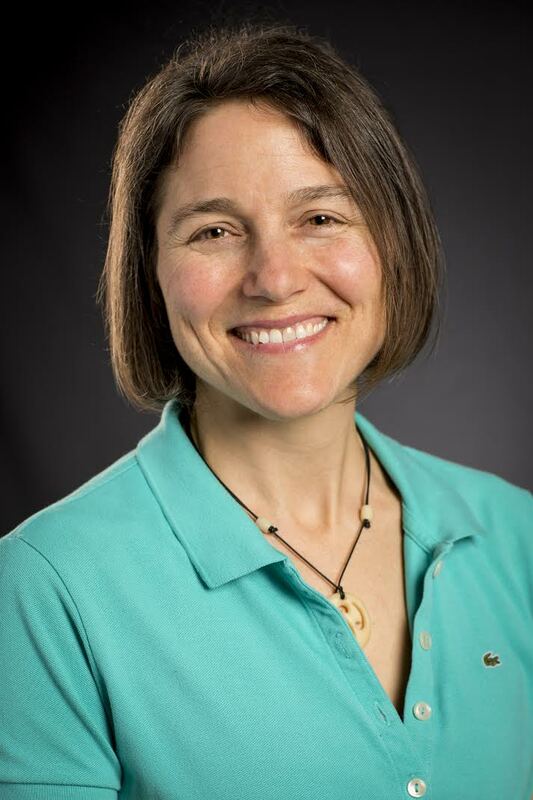 And in the College of Engineering, Associate Professor Heidi Gough has partnered with a Jordanian university to have students study water engineering in drastically different regions of the world. These and other faculty, along with the Office of the Provost and the Office of Global Affairs, are committed to making the life-changing study abroad experience accessible to all students. 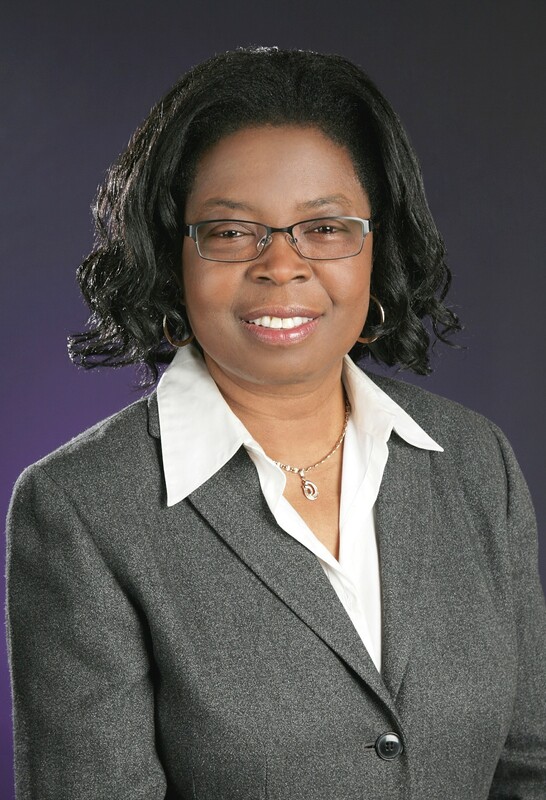 Many of Associate Professor Mabel Ezeonwu’s graduate students in the UW Bothell School of Nursing are working professionals for whom a full study abroad program would be challenging — if not impossible. So Ezeonwu found a way to give her students a study abroad experience in a way that works for them. In 2016, she partnered with Seattle-based nonprofit Guatemala Village Health (GVH) to launch the 12-credit cross-disciplinary course, Global Health Promotion: Health Services Delivery in Resource-Poor Settings. GVH has been providing health services with partners in Guatemala for years; together with UW students, they have been able to provide care at unprecedented scale. The program is designed to be as feasible as possible for working students, even before they get on the plane. It meets the Nursing program’s core requirements and runs during summer term. It’s also a hybrid course, combining online and classroom coursework with field work and team-building activities. Students spend the first eight weeks at home, learning about global health issues in the context of Guatemalan policy and culture. Then, they go to rural Guatemala for two weeks, where they help provide on-the-ground health services to hundreds of people in a hands-on clinical setting. Advance team-building is crucial, as in Guatemala, “the work is pretty much 24/7,” says Ezeonwu. The program welcomes a mix of students from all disciplines, both graduates and undergraduates. “The diversity of backgrounds makes the program unique,” Ezeonwu says. 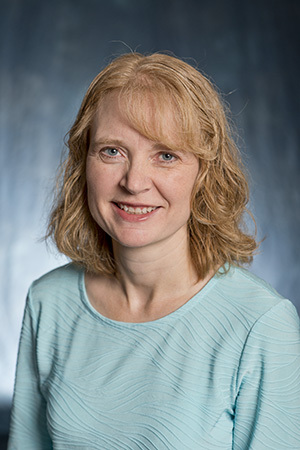 She creates working groups that draw on students’ complementary skills: for example, the graduate students and experienced registered nurses bring clinical expertise and leadership experience, and undergraduates in majors ranging from cultural studies to biology bring different disciplinary perspectives. Once in Guatemala, everyone is part of the team that delivers care — whether doing lab work, taking vital signs or running health education sessions. With GVH, the UW students visited seven villages, setting up mobile clinics with multiple stations (such as pharmacy, lab or education) in each one. Over the course of two weeks, they served around 600 patients. These are mostly remote Mayan communities without local sources of health care. Some of the most impactful work is the most basic, such as tips on handwashing, tooth-brushing, boiling water or wearing shoes to avoid parasites. “For students to see what it takes to deliver care in an environment with almost nothing, with almost zero resources to work with, that’s education at its best,” says Ezeonwu. Program participant Stephanie Covel, former Masters in Nursing student and now surgery center manager at UW Medicine’s Northwest Hospital & Medical Center, agrees. “You can’t really put into words how it might affect you — being able to see how other people live in the world, and how that opens your mind to global issues,” she says. Students also learn the value of collaboration — across disciplines, communities and nations — to make health education accessible for patients and students alike. These perspectives, for Ezeonwu, are at least as important for students as their discipline-specific learning. In looking ahead, Ezeonwu has a lot of ideas for how the program could expand. For example, she envisions a training program for health practitioners and community health promoters in Guatemala who don’t have access or time to attend traditional degree programs. In the meantime, GVH has reported that partnering with UW Bothell has allowed them to see many more patients than ever before. As the program grows, its impact spreads — from Washington state into rural Guatemala, and back again. UW Tacoma students in Sao Paulo, Brazil, 2017. Led by UW Tacoma Senior Lecturer Margaret Griesse and UW Seattle graduate student Angelica Macklin, the course Brazil: Movements and Intersections combines Portuguese language learning with research into contemporary Brazilian social movements. Students earn 13 credits in four weeks, travel from Sao Paulo to Rio de Janeiro to rural west Brazil, stay with host families and engage with university students. Photo credit: Margaret Griesse. Kristi Straus, lecturer in the Program on the Environment, has long been practicing the “flipped classroom”: in which students study course content outside of class, and do more active learning during class time. The idea — increasingly popular nationwide — is that “flipping” makes best use of learning time, as instructors can support students through problem solving, discussions and other applied learning activities in the classroom. In partnership with the Office of the Provost, Straus piloted a “global flip” program in Fall 2017: a study abroad model that allows students to maximize the international experience in a shorter time frame. With support from Center for Teaching and Learning consultant Wei Zuo and Academic Technologies, Straus worked with professors at Tsinghua University to design an introductory course on sustainability for students on both campuses. Tsinghua students watched recordings of Kristi’s lectures in her UW classroom, so that all students had in-person sessions at their own schools as well as access to an international, multi-cultural and collaborative online learning environment. 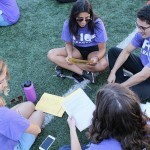 Throughout the course, students connected online — via WeChat, online discussion boards and video conferencing — to think critically about how personal choices affect social, economic and environmental sustainability. They shared assignments and activities while comparing sustainability challenges and approaches to solutions in the U.S. and China. Then, the real abroad portion: 10 days in Beijing. Together, the UW and Tsinghua students heard from well-known Chinese researchers and worked in teams on course materials. But they also did more active, applied learning activities, with each other and their instructors there for support. They took field trips to industry labs, a water treatment plant, and solar and wind farms, to see Chinese sustainability efforts at work. 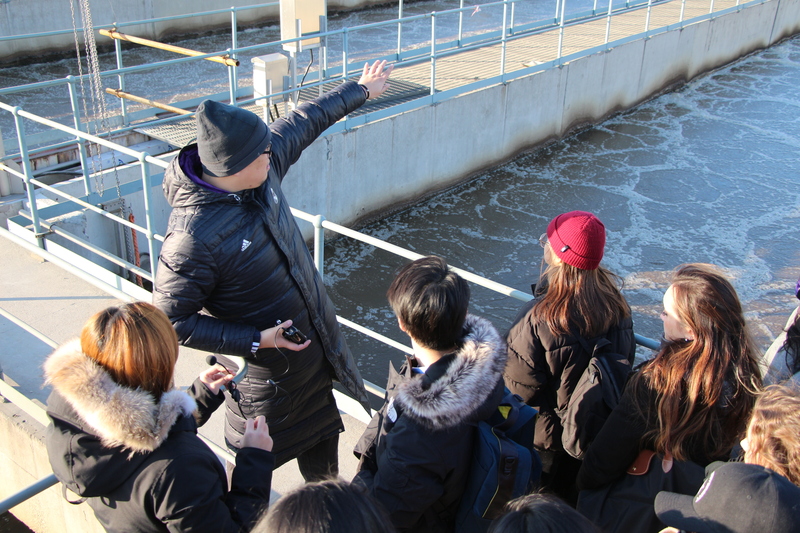 UW Students at the Gaobeidian Waste Water Treatment Plant learned about how waste water is managed in Beijing. Photo credit: Shunxi Liu. 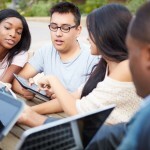 The global flip model combines short-term study abroad with Collaborative Online International Learning (COIL) to maximize the international experience for students. As the global flip model includes shorter-term travel, it increases access to immersive global experiences both for students in technical majors who have less flexibility, and for students who may not otherwise be able to afford them. Faculty in other departments, including English, Philosophy and Oceanography are currently seeking partners in countries around the world to replicate the global flip. Students of water engineering can learn a lot from studying local systems in the Pacific Northwest. 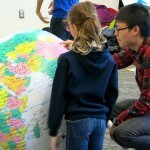 But what might students learn from comparing those systems to a completely different climate and region of the world? 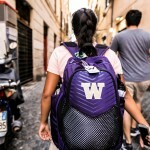 In 2012, the College of Engineering was lacking for study abroad programs, but Associate Professor Heidi Gough was determined to give students options for studying abroad. “If students are strong enough to get a degree from the UW, they should have the opportunity for an international experience,” says Gough. A professor of water engineering, she also felt it crucial that students apply their learning to different climates, populations and resource situations. So she contacted colleagues in one of the most water-scarce nations in the world: Jordan. With professors at the Jordan University for Science and Technology, she co-designed and launched the course Water in an Arid Land in 2012. To make this program as feasible as possible for students, Gough made sure the five-credit course would count as a technical elective (required for the engineering degree). Gough runs her course during the four-week Early Fall Start term to work around students’ summer internship schedules. By 2018 she has run the program four times, each time bringing 8-12 students to Irbid, Jordan. There, UW and Jordanian students have a completely immersive experience — living, traveling and working together. 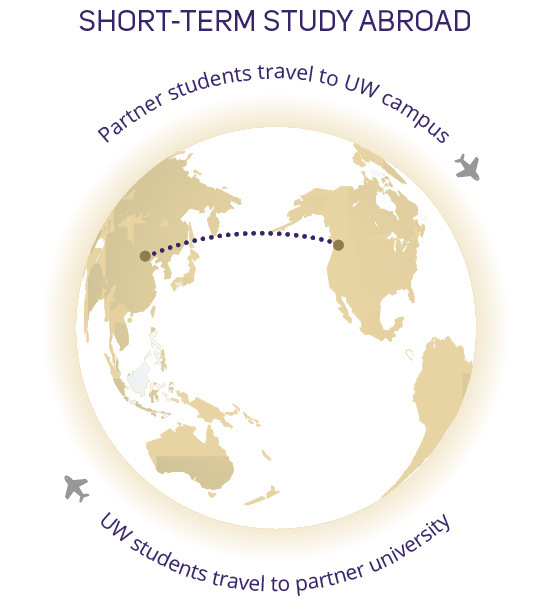 The UW students tend to be a mix of domestic and international, undergraduates and graduate students. They also tend to be a disciplinary mix, including students specializing in chemical, structural and/or water engineering, or environmental studies. All work together on projects with Jordanian undergraduate and graduate students — collaborating across cultures, disciplines and educational levels. Currently, Gough is working hard to extend a similar experience to Jordanian students, by bringing them to study alongside UW students on the Olympic Peninsula. Her course Sustainable Water in a Wet Region launched in summer 2017 with UW students, who lived and worked on the Peninsula for four weeks. In Washington, students had a range of cross-cultural experiences: visiting tribes in Kitsap County to learn how they manage resources; comparing values around water across tribes and towns; and talking with city officials about sustainability in different regions. Gough designed the course with the mixed cohort — Jordanian students with UW students — in mind, and is making progress around initial obstacles to Jordanian students receiving course credit. She looks forward to Jordanian students joining in the experience in Summer 2019. 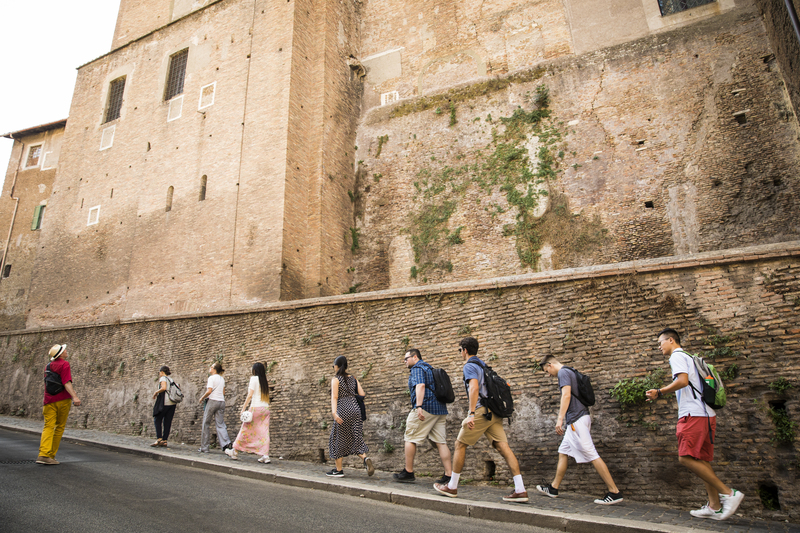 Participants in Engineering Rome: a five-credit course, led by Associate Professor of Engineering Steve Muench, that takes students to Italy for three weeks during the summer-fall quarter break to study 3,000 years of Roman and Italian engineering. Photo credit: Mark Stone, University Marketing & Communication.